A Heart Cures (AHeartCures.org) Campaign will Run through November, which, in addition to being a month of giving thanks, is Pulmonary Hypertension Awareness Month. The Pulmonary Hypertension Association (PHA) is inviting people from all walks of life to publicly acknowledge random acts of kindness by taking the A Heart Cures Challenge. PHA is asking people to record a 10-second video of themselves thanking loved ones for being there for them when it was needed the most or strangers for showing them kindness when it was least expected. The social media challenge runs through November, which, in addition to being the month of giving thanks, is Pulmonary Hypertension Awareness Month. Awareness for people with pulmonary hypertension (PH) is a matter of life or death. In PH, arteries in the lungs can become damaged, narrow or stiff, putting pressure on the right side of the heart, causing it to work extra hard to push blood through those arteries. Common symptoms of PH include shortness of breath, fatigue and chest pain, and the disease is often misdiagnosed, for example, as asthma. This leads to delays in proper diagnosis and treatment, costing patients valuable time. With early diagnosis, proper treatment can extend and improve PH patients’ quality of life. PH can exist alone or in association with other conditions, such as scleroderma, lupus and other connective tissue diseases; congenital heart disease; chronic liver disease; HIV; congestive heart failure; COPD; and other illnesses. While PH is incurable, people diagnosed with one form -- chronic thromboembolic pulmonary hypertension (CTEPH), caused by old blood clots in the lungs -- may be candidates for a surgical procedure that can potentially reduce or even normalize their lung blood pressure. Funding from Actelion supports PHA’s Awareness Month efforts. Funding from Bayer Healthcare supports PHA’s CTEPH Awareness efforts. Last year, PHA launched its #Heart2CurePH campaign through donated national TV, radio, billboard, transit and magazine ads to raise awareness about how the PHA community has a heart to cure PH. The 2016 Awareness Month campaign builds upon that original concept with the A Heart Cures Challenge. By giving people a simple way to thank others for random acts of kindness, PHA is able to spread awareness about PH and possibly save lives in the process. PHA introduced a video teaser of the A Heart Cures Challenge Oct. 1 to its social media community, which includes thousands of PH patients and their friends, families and professional caregivers who are eager to do all they can to spread awareness about PH. The challenge is a simple ask. Thank someone who has done something kind for you in the past and say, “I’m taking A Heart Cures Challenge” and share the video via social media with the hashtags #AHeartCures and #Heart2CurePH, and ask your social media friends to join us. 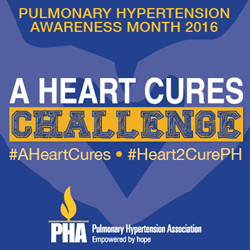 To see and share the teaser video, go to http://www.AHeartCures.org on Nov. 1, for more details about the challenge; links to PHA’s resources for the patient, medical, professional and research communities it serves in the U.S. and worldwide; and ways to support the PH community. Headquartered in Silver Spring, Md., the Pulmonary Hypertension Association (PHA) is the country’s leading pulmonary hypertension organization. Commemorating its 25th anniversary in 2016, PHA’s mission is to extend and improve the lives of those affected by PH; its vision is a world without PH, empowered by hope. PHA achieves this by connecting and working together with the entire PH community of patients, families, healthcare professionals and researchers. For more information and to learn how you can support PH patients, visit http://www.PHAssociation.org and connect with PHA on Twitter @PHAssociation and on Facebook at http://www.facebook.com/PulmonaryHypertensionAssociation.